The year is wrapping up, and we’re all hustling to finish our holiday shopping and prepare for the perfect Christmas season. Then, just a few days later, we’ll be intent on improving ourselves and making ambitious goals for the next year. I love taking the time to plan what I want to accomplish in the new year. I spend a few weeks planning and writing down each goal. I share my goals on my blog, and every month I update them with my progress, which helps keep me accountable. With this process, I’ve been able to reach at least 75% of my goals every year. If you, too, are a goal setter, you may focus only on the future, but that can be a mistake. Instead, before you start looking forward, take the time to look back at 2013 and all you have accomplished. For instance, my husband and I are in the midst of paying down a mountain of debt (the balance was $57,966.01 spread across credit cards and student loans when we started paying it down at the end of 2011). Every month money is tight, and honestly, sometimes I wonder if we’ll every be in a comfortable position financially. My husband keeps reassuring me that we are in a better position financially this year, but I always assume that is what he says because he’s a free spirit and I’m the financial worry wart. However, I took the time to look back, and I realized that he’s right. We are in a much better place than a year ago. At the beginning of January, 2013, my student loan balance was $4,218.94. This month, I just paid it off. That’s only one example. In each area of our lives that I looked at financially speaking, we’re in a better place. While I don’t necessarily feel the financial difference, the numbers on the paper don’t lie; we’ve made progress this year. When you’re in the midst of a financial struggle, whether it be paying down debt, trying to build your savings, or trying to increase your income, feeling like you’re not making any progress is normal. Getting ahead occurs so slowly that you often feel like your stagnating when you’re not. Inch by inch, you’re making progress, but when you’re deep in the forest, it’s hard to see anything besides your immediate location. You need to consciously look at where you were 12 months ago so you can appreciate where you are now. But most of us never take the time to do so. That’s too bad because by reflecting on the progress you’ve made, you can build your confidence and make accomplishing your goals in the future even more likely. Plus, by looking back at what you’ve accomplished and the progress you’ve made, you can better set your goals for the next year. A car has a rear view mirror because you have to see where you’ve been and what’s behind you to help you continue going forward. The same is true with your financial life. Have you taken the time to look at the financial progress you make every year? 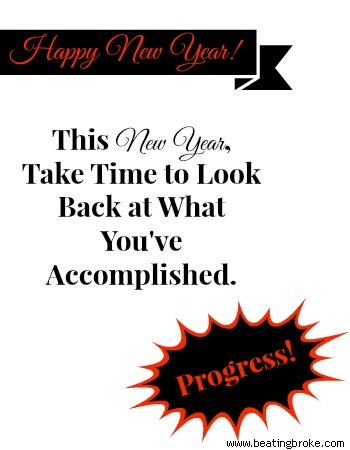 Looking back and seeing what you’ve accomplished certainly can give you the motivation to continue forward….good luck on your goals in 2014! This week is my reflection week. I’m excited to look back and see how far (and short) we are to our goals. Great post, Melissa!! We are just ending year one of our debt payoff journey, so I totally get what you’re talking about here. It feels like we haven’t done much, but we’ve made a good start, and that counts for a lot. It’s so important to keep track of what you’ve done, not just where you’re going. Thanks for the great advice! I think you’re onto something. I always feel frustrated and like I haven’t accomplished enough around New Year’s (and my birthday), but when I take time to look back at what I’ve done instead of at what I’m still struggling to reach, I usually find I’m doing better than I though. Great post! In 2013, we paid off over $15,000 in debt, increased our net worth by almost $15,000, and cash flowed about a month and a half of travel. I’d say it was a pretty successful year and I’m looking forward to an even better 2014!